The CICM is pleased to announce the new releases of the the HOA library (v2.2) for Max and Pure Data. Some updates and new features : new binaural rendering, new tutorials, exchanger for Ambisonics data format, optimizations, etc. Sound space is one of the first dimensions of the contemporary musical thought, specialy in the electroacoustic music domain but also in intermedia arts. In this context, the CICM has made of the spatialization its main research axis. This projects « La spatialisation du son par les musiciens pour les musiciens », « Des Interfaces pour la mise en espace du son » and “HOA 3D” developed as a part of the LABEX Arts H2H aims to give spatialization models based on high order ambisonics to musicians and graphical interfaces to facilitate the manipulation of signal processing. It takes place between the MSH Paris-Nord and the plate-forme Arts-Sciences-Technologies. Project partners have been Louis-Lumière, GRAME, the Muse en Circuit, the University of Montréal, the ZKM, IRCAM and the GMEA. HOA Library allows musicians and composers to synthesize, transform and render sound fields in a creative and artistic way. 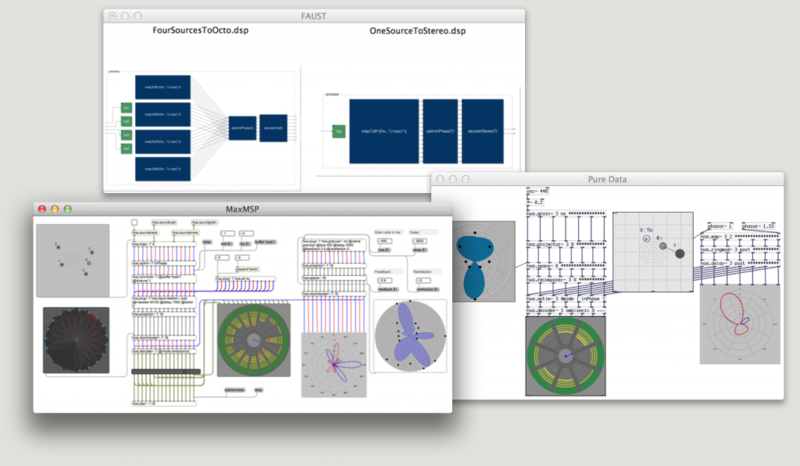 This library facilitates the understanding and the appropriation of key concepts of ambisonics. Thanks to original graphical interfaces a lot of new signal processings are allowed like diffuse sound field synthesis, perspective distorsion or spatial filtering. HOA library is open-source and free and offers a set of C++ and FAUST classes and implementation for Max, PureData and Unity.